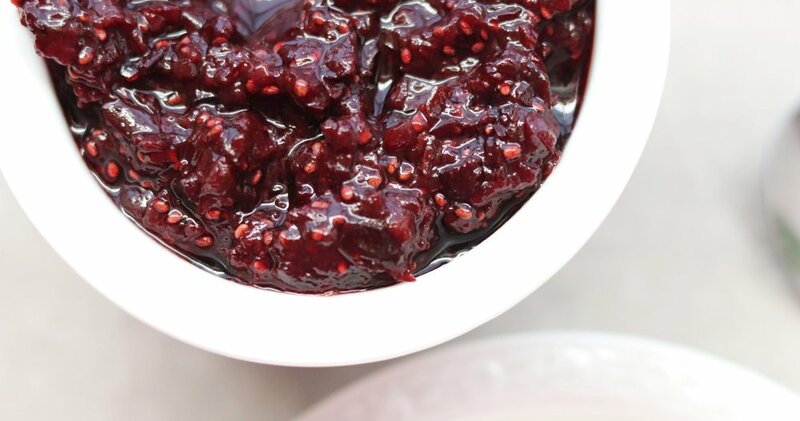 It's hard to believe how easy this jam is to make - only 4 ingredients! As far as jams and jellies go, cherry jam is one of my favorites. I love the sweet-tart flavor of cherries on toast or biscuits or swirled into yogurt or oatmeal. Packed with antioxidants, cherries are full of good nutrition (see Spotlight on Cherries!). The key to this mixture becoming jam is the chia seeds. Chia seeds are loaded with omega 3 fatty acids, fiber, and antioxidants. These seeds absorb the liquid from the cherries, forming a gel. Only four ingredients - cherries, chia seeds, honey and vanilla! Simply place the cherries, fresh or frozen, into a food processor (or blender) with a little honey and a splash of vanilla. Pulse a few times to break up the cherries. Pour into a saucepan and heat to a simmer for about 10 minutes. Remove from heat, add the chia seeds and let cool completely. Refrigerate for several hours and you have jam that will keep, covered, for about 10 days. Or swirl into yogurt (my favorite!). Place the cherries, honey and vanilla in a food processor or blender. Pulse a few times until cherries have broken into smaller pieces. (Note: can process longer for smoother consistency). Pour into a medium size saucepan and bring to a simmer over medium heat. Cook for 10 minutes. Remove from heat and stir in the chia seeds. Let cool to room temperature. Cover and refrigerate for several hours. Store covered in the refrigerator for up to 10 days.